I have some Stachys towards the bottom of the garden. Not many people can resist stroking the soft furry leaves of Stachys. 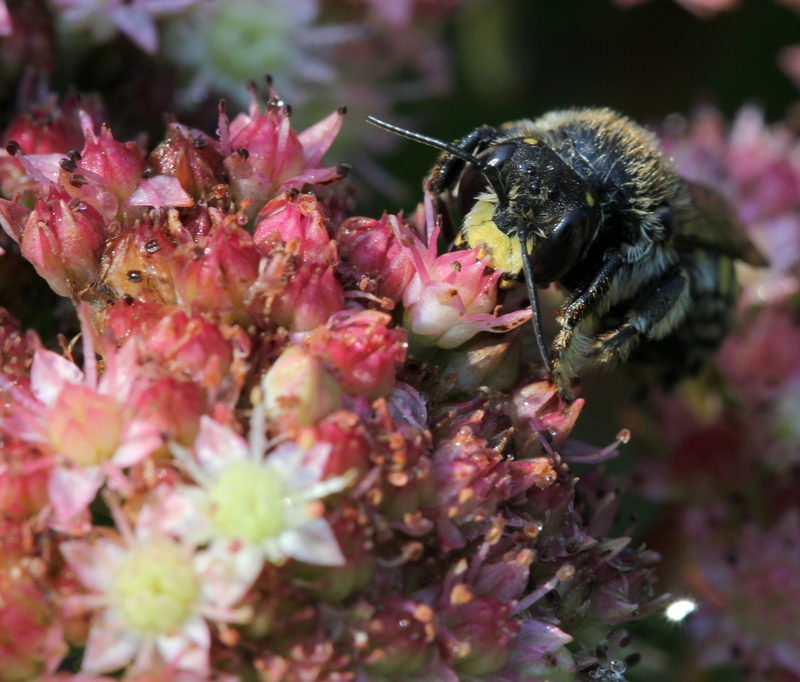 But if you see patches on the stem or leaves that are lacking the hairs, it could be that you have an interesting bee in the neighbourhood. 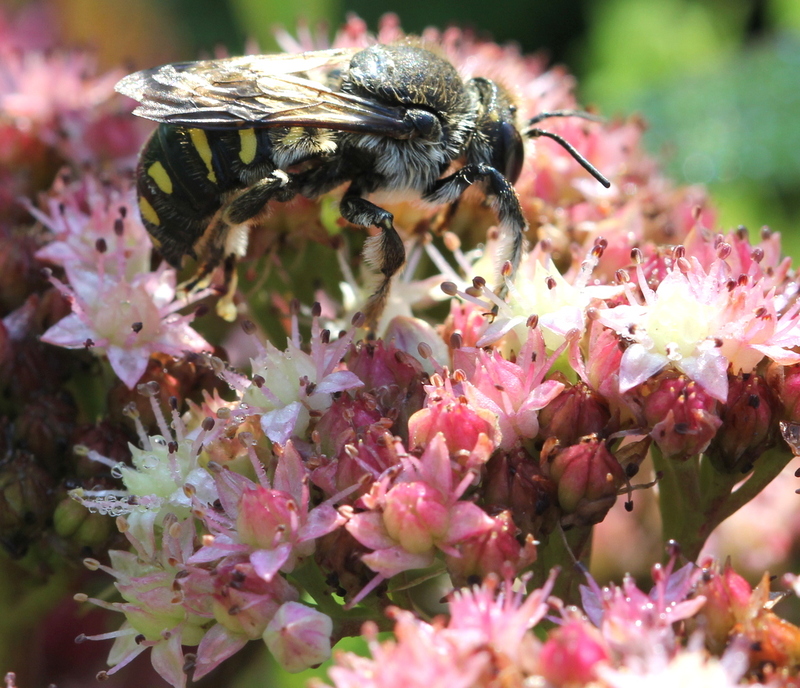 Yesterday in the garden I noticed this Anthidium manicatum, or wool carder bee making repeated visits to my Stachys. She must have razor sharp mandibles as the stem is shaved in a firm downward movement. She has now collected her bale and is about to fly back to her nest. I watched her arrive and it took less than a minute for her to roll up a ball of the soft fibres. 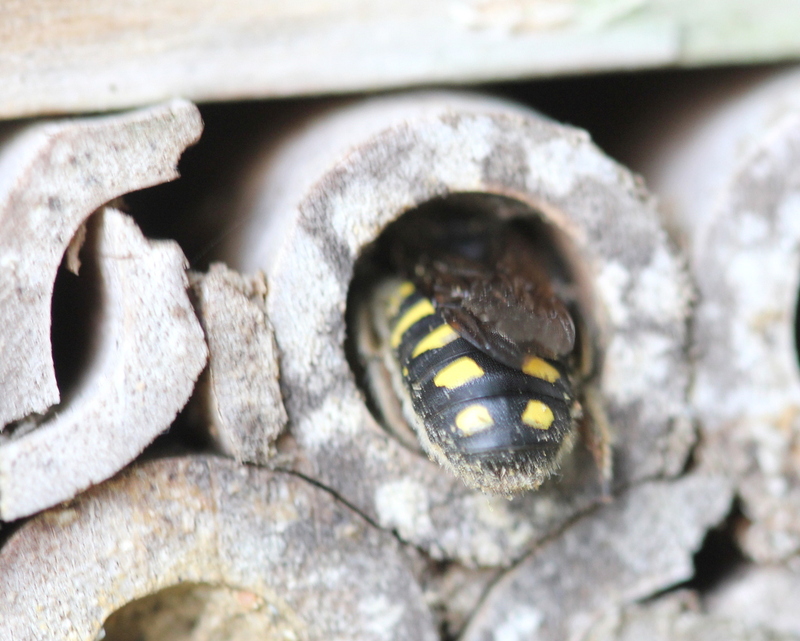 I don’t know where she has her nest but last Setember one nested in one of my bee houses and I described it in my other blog A French Garden. 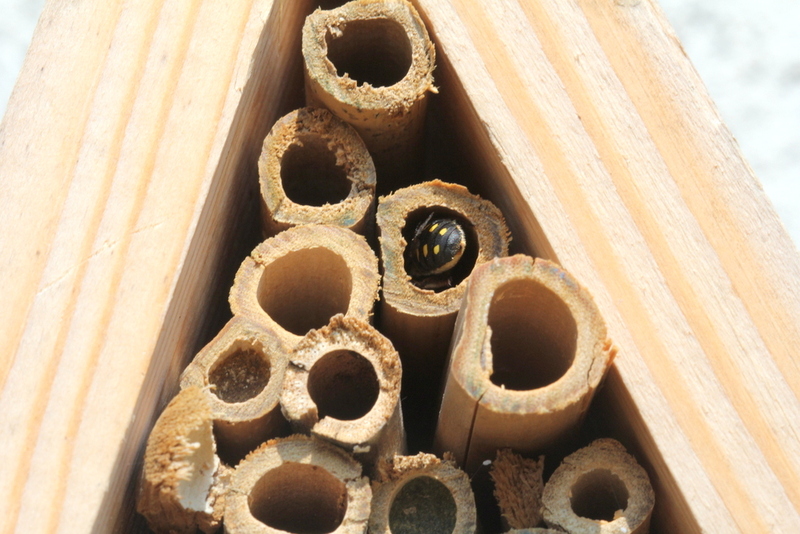 Check out Mason bee hotels or houses to see where she nested. 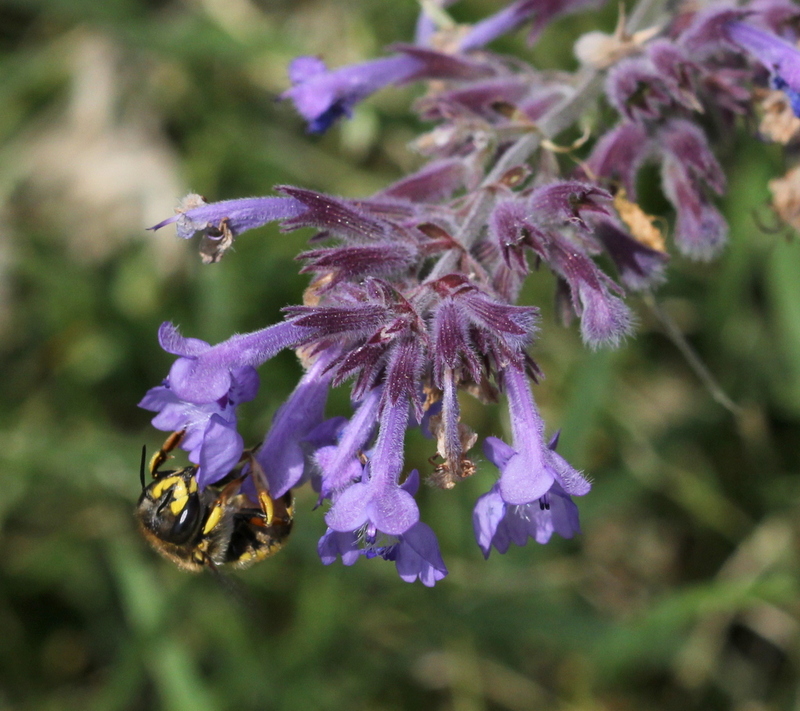 It was not only the Anthidium that was interested in the Stachys. As I waited for the Anthidium to return, I noticed an Anthophora furcata. Stachys looks and incredibly soft and welcoming plant for bees. I shouldn’t forget the Carpenter who passed by too but she gets everywhere! 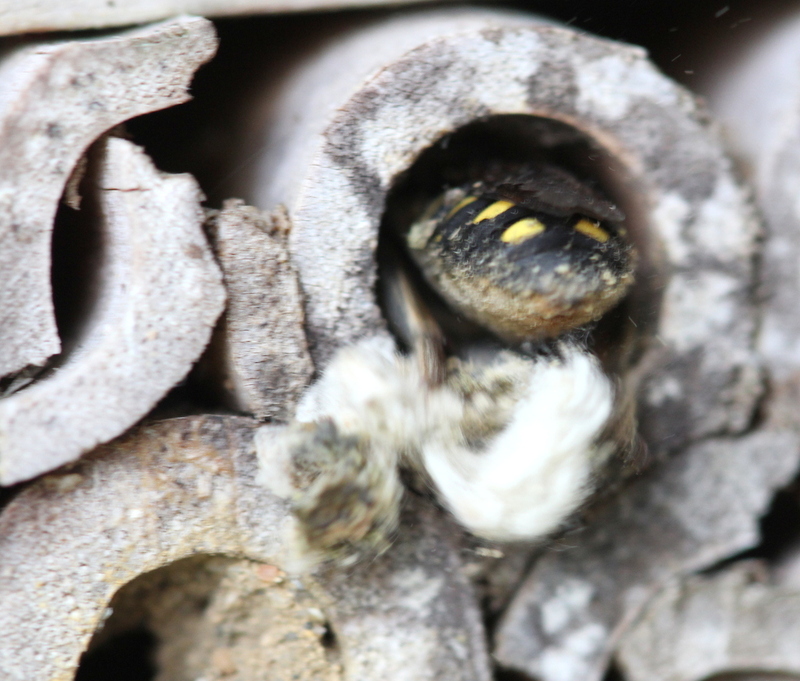 A bee un-making her nest. 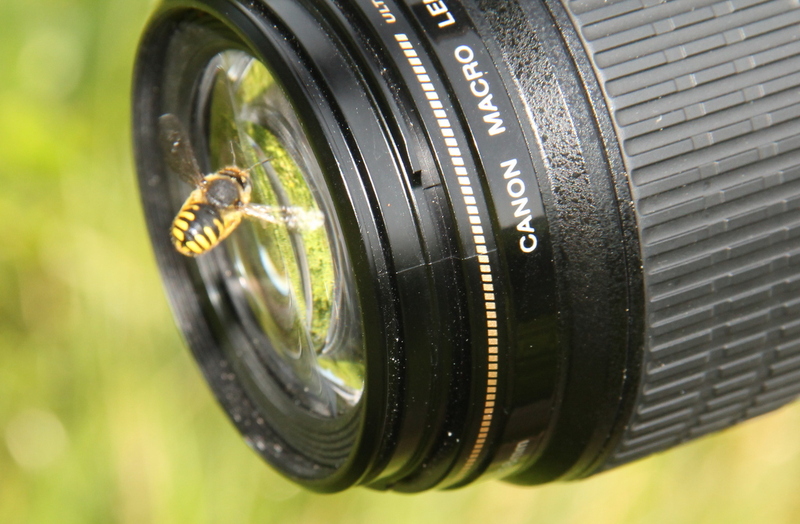 In my last post I showed the some of the photographs I had taken of Anthidium Manicatum but I did not mention that she nests in my garden. 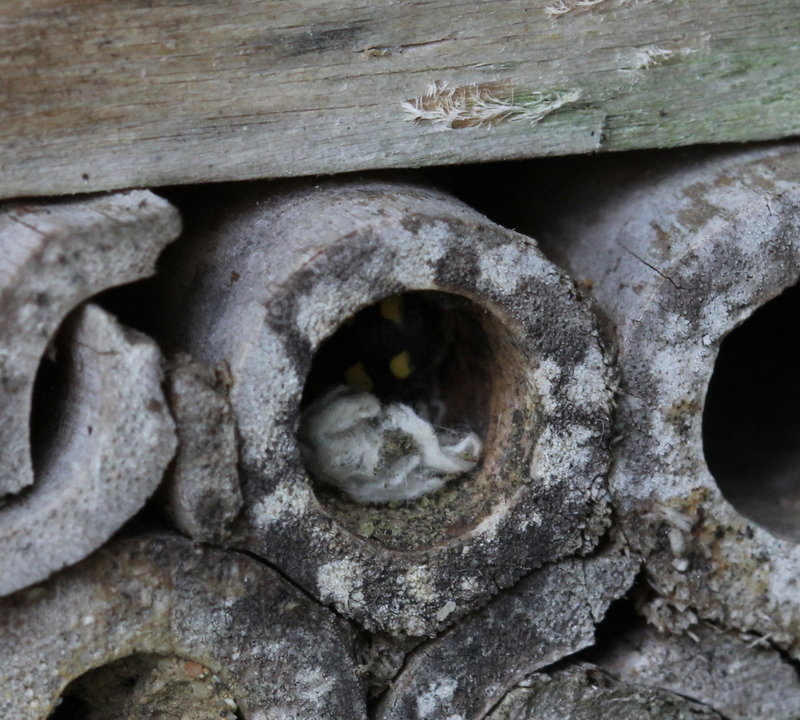 To be completely honest, the first time I saw her survey my old bee hotel I thought she was a wasp and ignored her! 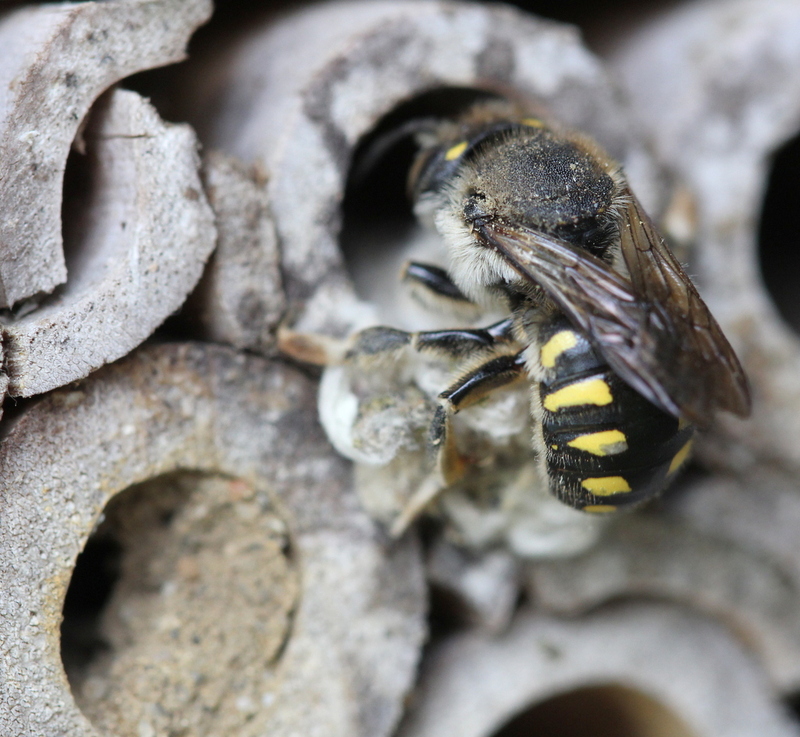 Now I am a year older and wiser and I have found out that she is also called the Wool carder bee in English or Abeilles cotonnières in French. this is because she collects the fibres from plants with furry leaves like the different varietes of Stachys. I have Lychnis coronaria (Silene coronaria) growing in the garden and huge plants of common Mullein (Verbascum thapsus) grow close by so there is no shortage of the basic raw materials for her nest. I have seen delightful pictures of female Anthidiums bringing round bales of cotton for their nests but I have never seen them cropping the leaves, myself. 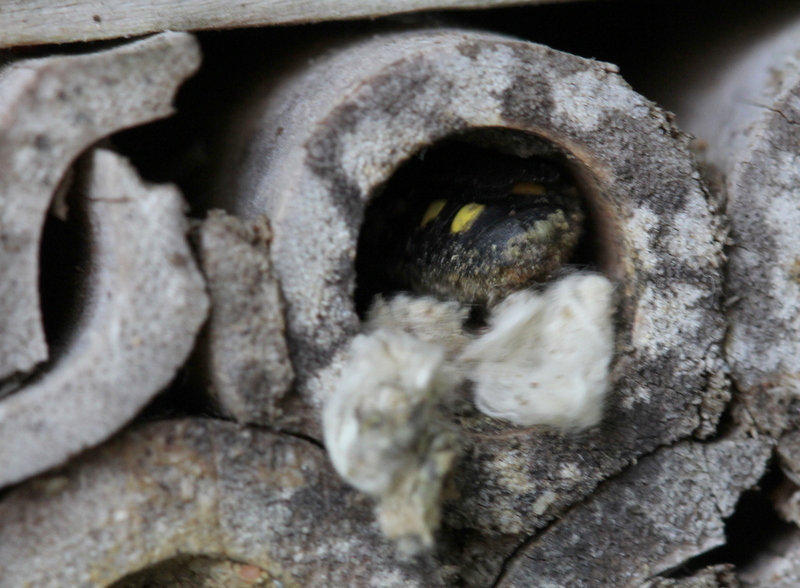 I did see that an Anthidium was building her nest in my old bee house under the lilac tree in the middle of August, so I tried to keep an eye on it. 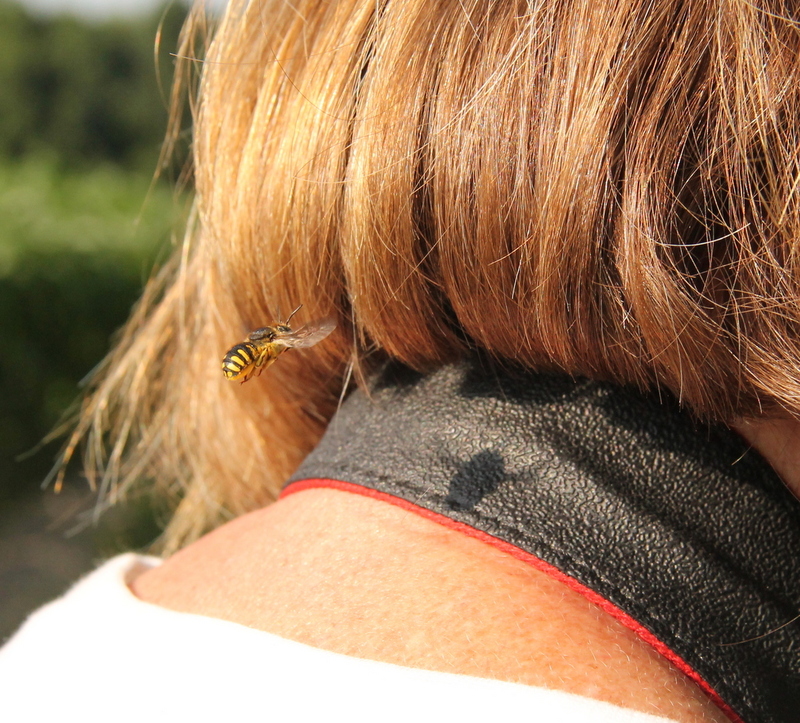 I was rewarded on the 29 of August when I saw a female Anthidium fly into the bee hotel. She apparently was making her nest. I was really excited to watch her build her nest! She seemed to want to do some re-arranging first. She had gripped a ball of the cotton material between her legs as I had seen before in photographs but in those photographs she was taking the cotton to her nest. Here she was taking it out. After recklessly dropping the cotton she came back for more. 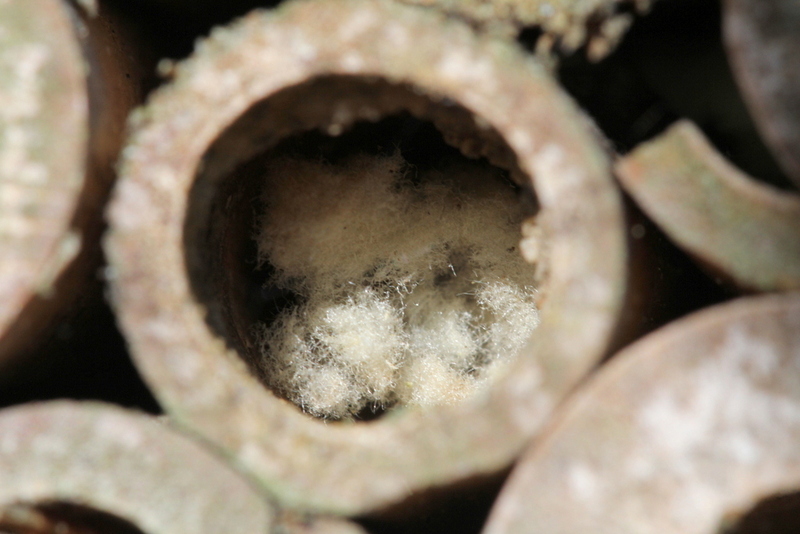 She repeatedly returned and went deep into the hole to unearth more of the cotton. She heaved some of the materiel out with kicks from her back legs. Sometimes she baled it together and counterbalanced her weight against it to pull it out of the bamboo. These are a sample of the photographs I took in sequence over a period of ten minutes and I marvelled at the quantity of cotton she was removing and I thought of the time and energy it must have taken her to gather it. 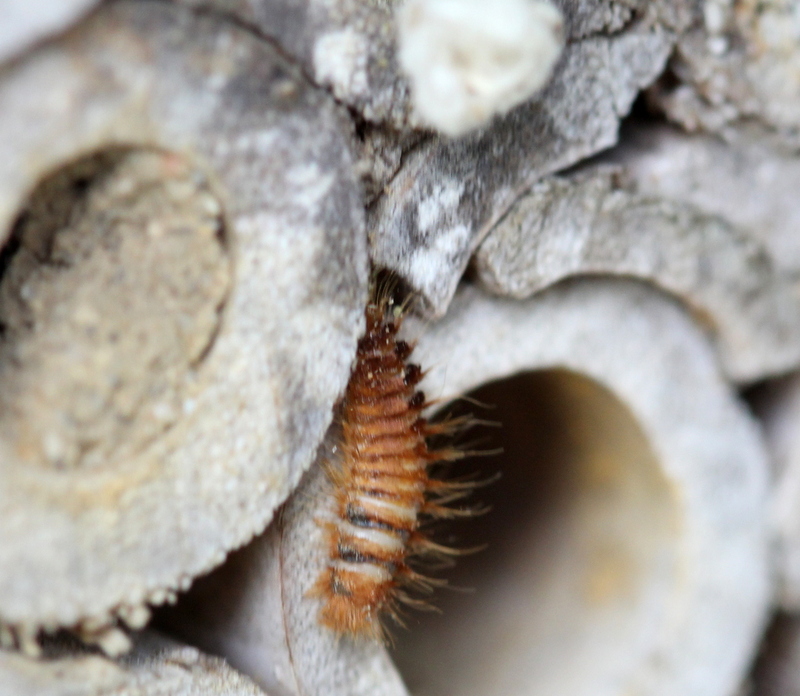 All of a sudden I was startled by a bright orange creature wriggling rapidly out of the Anthidium’s nest. I apologise for the poor pictures but I was already having difficulty with poor light as the nest is under a lilac tree and the creature was moving rapidly. It was not alone and I briefly saw another one appear and then disappear. 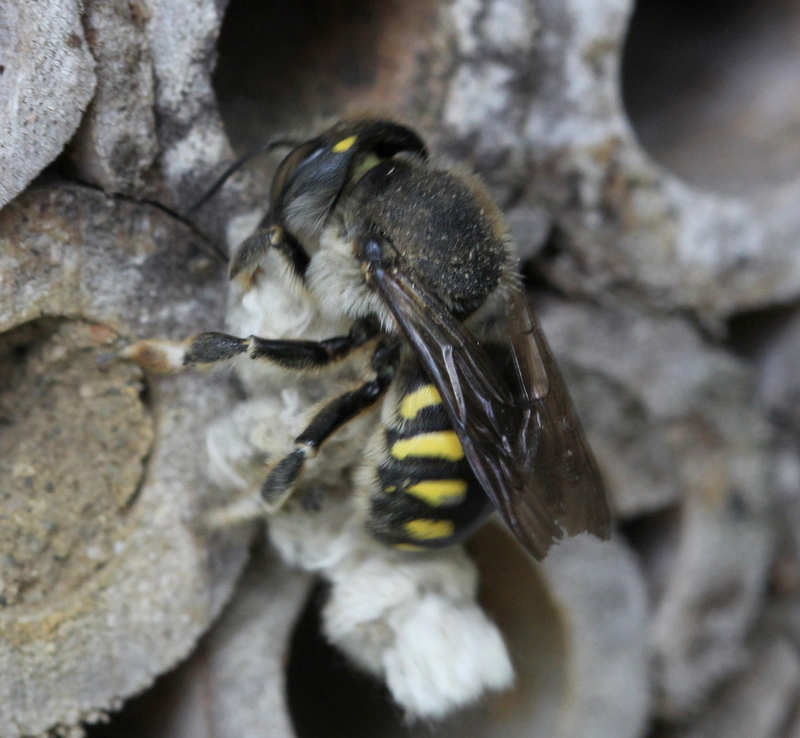 My sympathies are with the Anthidium who continued with her purge of the nest material. I was not prepared for the deluge of nesting material, and as the cotton fell it was being dispersed by the wind. I would have loved to have gathered the contents to find out just how much she had packed in. It seemed an impossibly large volume to extract from the bamboo tube. Unfortunately, it is an unfinished story as I do not know what these creatures were. Were they parasites? 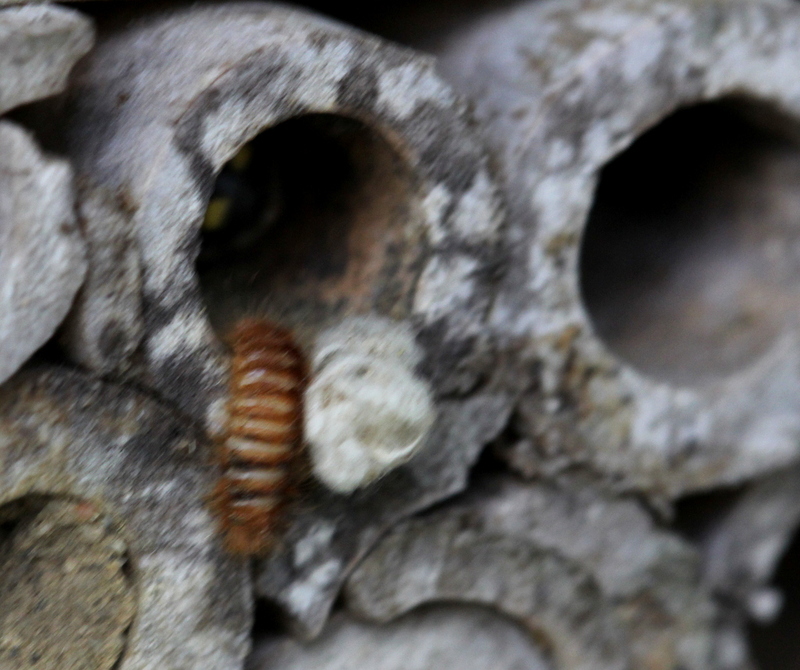 Were they chance visitors to the bee hotel? Perhaps someone can help me here. 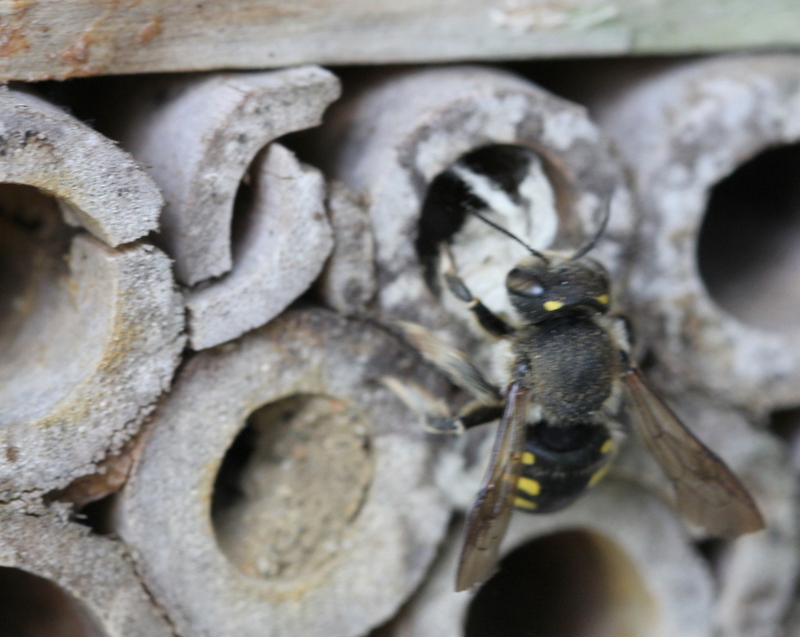 Earlier the same day I had seen an Anthidium exploring one of my new bee hotels so hopefully there will still be plently of Anthidiums in the garden this year. I need to add a post script here. It is now November 2017 but because of a kind comment my Anthidium has been identified as Anthidium septemspinosum and the larva as a species of Dermestidae or carpet beetle. 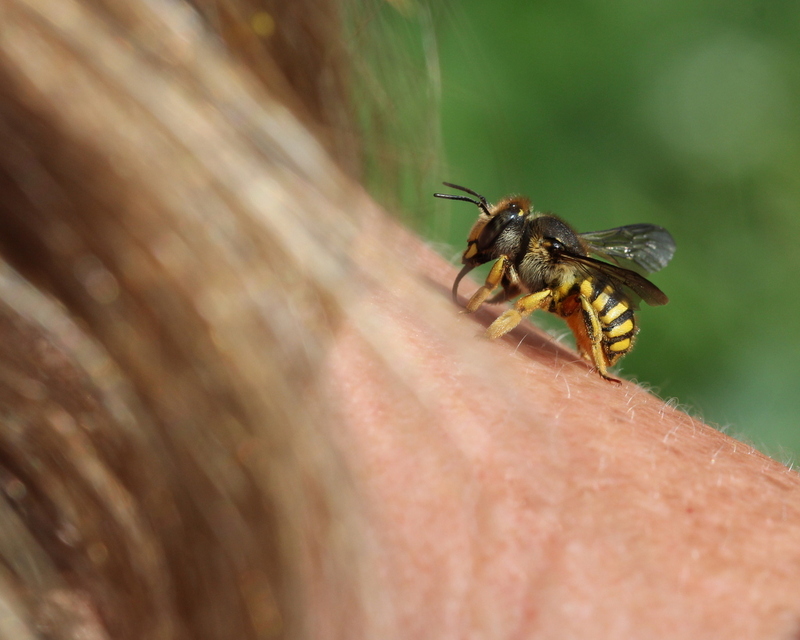 I can now see my bee has black legs whereas I have other Anthidium in the garden which have much more yellow on their legs so possibly manicatum. I cannot do better than that as I cannot find a key to help identify the different types of Anthidium. Perhaps the French names Anthidie à manchettes should have alerted me to their legs. I took this photo of a male in 2013 and the yellow colouration can be seen under the lovely down he has on his legs. 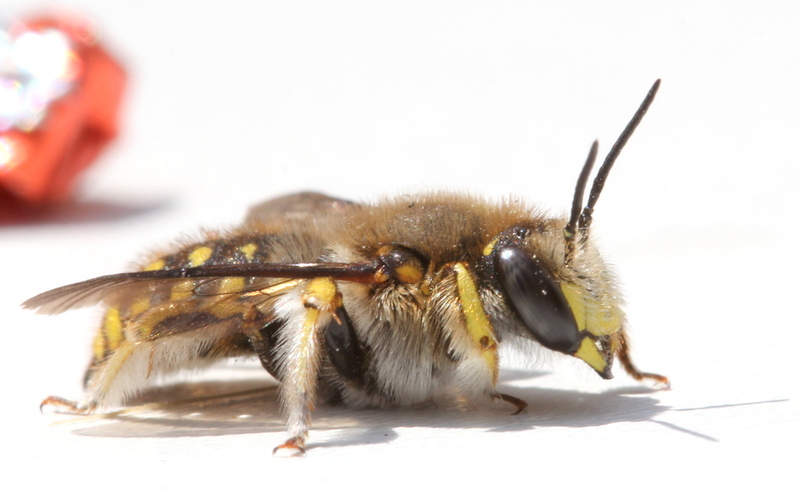 I see a lot of Anthidium manicatum in the garden in the summer. Like most bees it is a question of what flowers you grow. I have several large clumps of nepeta, lots of lavender and different sedum. There is a large clump of nepeta in a sunny spot in the back garden with a sedum right beside it. Paradise for the Anthidiums! The males can be recognised by the shape of the five prongs at the end of their abdomen. It is not always easy to see the prongs when they are at rest on flowers. You can see four in the photograph above and have to imagine the fifth on the other side. The curve of the rear three prongs is also diagnostic. I would also like to add that no bees were injured to deliver these close-ups and he was shortly patrolling the Nepeta after his photo session. In this photograph my bee is posing with his middle leg forward to show off another particularity of the Anthidium bees. 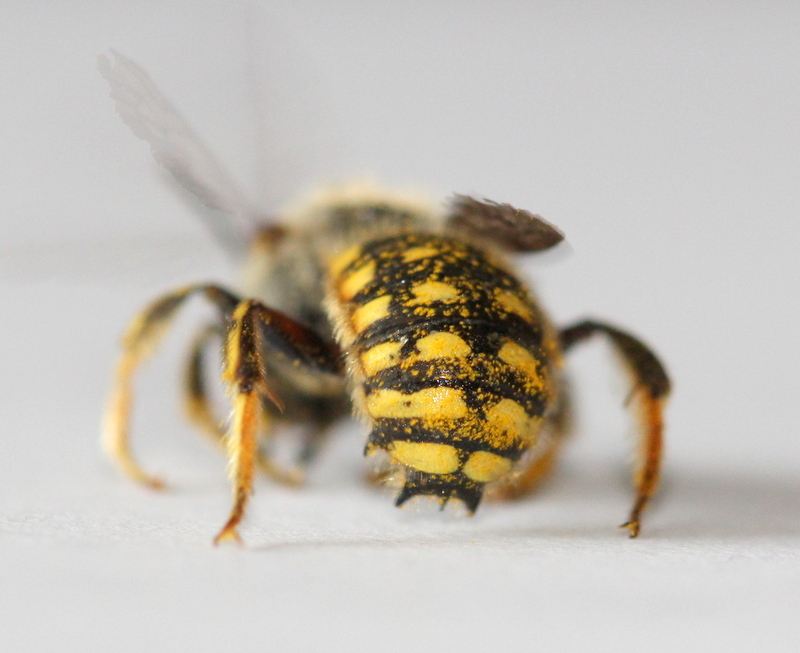 Bees have a claw at the end of their legs with a little appendix or arolium in the centre of it. 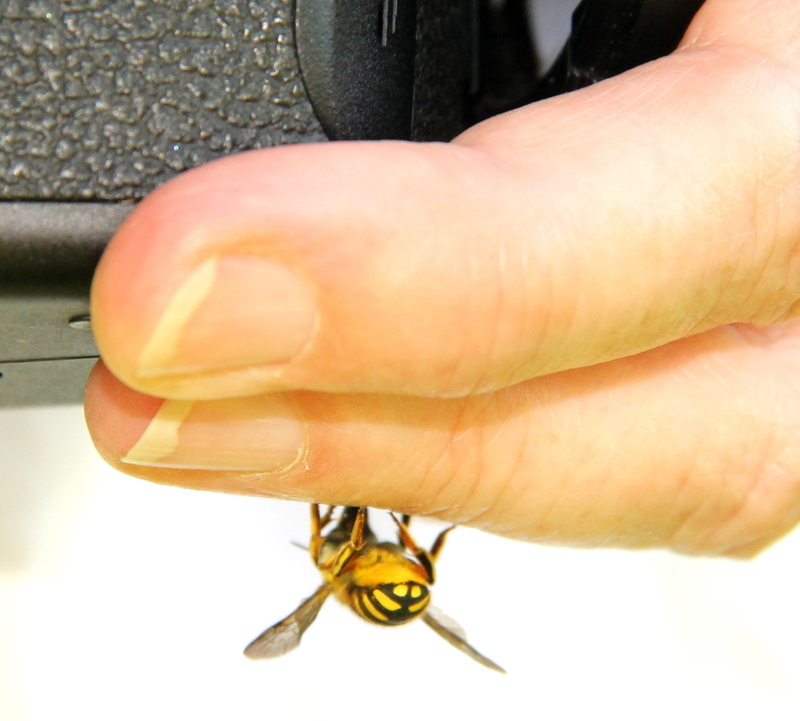 Anthidium have no arolium on their claw – just a 2-pronged claw! Well I think he is cute. The female also has a yellow face but the shape is different. I was photographing this one when – bang – a male arrived. No courtship, no preambles, in fact, no choice. 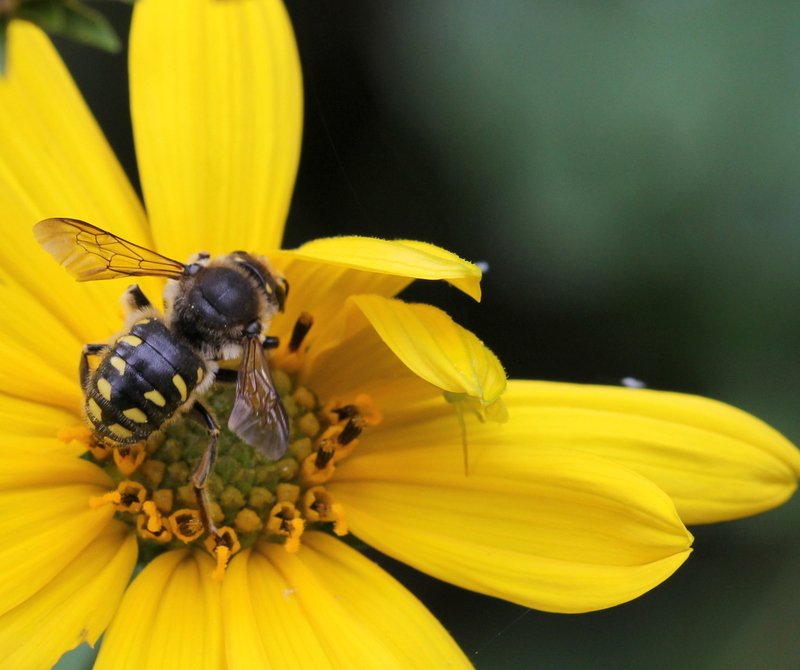 Some male bees can be considerably smaller than the females but the Anthidium males are larger than the females so it is a case of brute force. 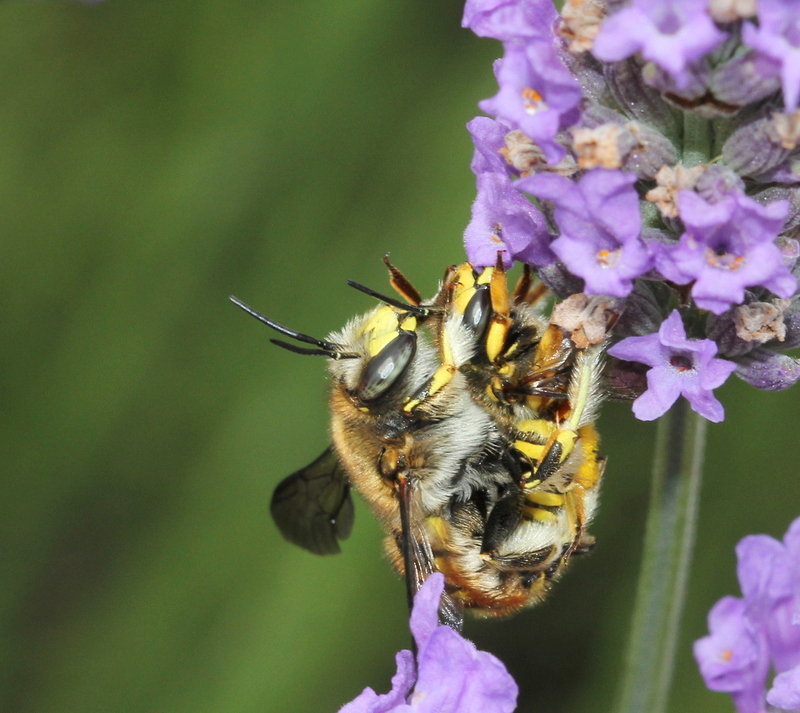 I was enjoying watching the Anthidium and the Anthophora in the lavender in July and every now and again there was the – bang. The female Anthidiums were very long suffering and seemed to ignore the males. 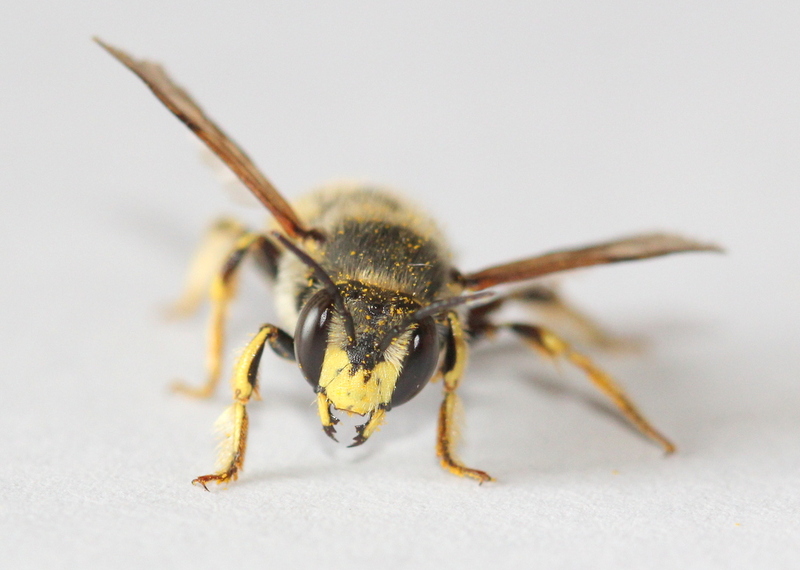 The male Anthidiums have a bad reputation for being aggressive towards other bees and even wasps and are seemingly capable of tearing their wings with the sharp prongs on the end of their abdomen. 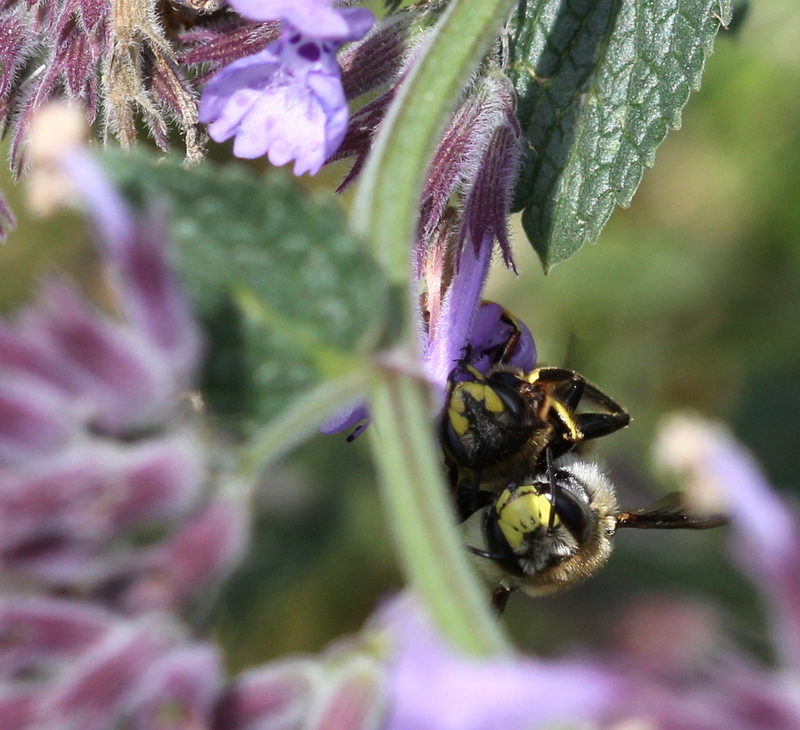 I have not seen this aggression as they share the Nepeta and other flowers with lots of other insects. Maybe the ones in the Charente Maritime are more laid back – it would not surprise me, it is that sort of place. As I said, I have never found them aggressive. 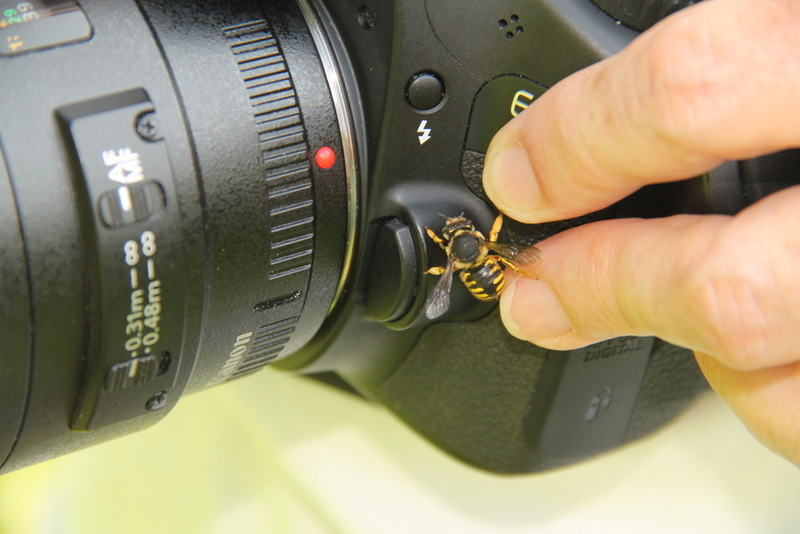 My fifth bee identification ends with a bee kiss.